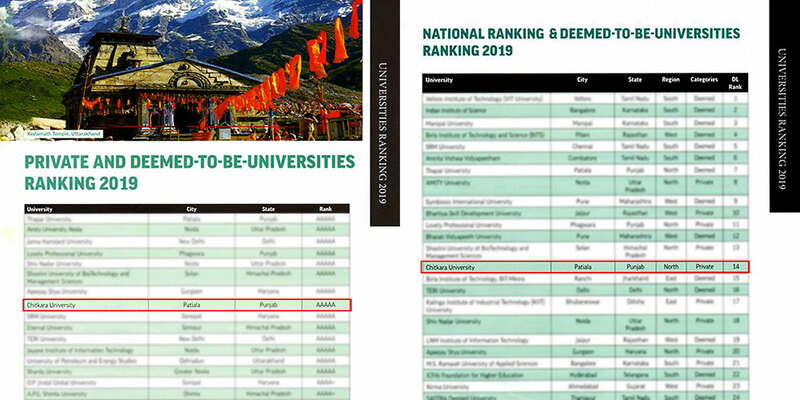 Chitkara University has been Ranked ‘One of the Best University in North India’ with AAAAA Rating and has been accorded All India ’14th Rank’ in ‘Private and Deemed University’ by Digital Learning Magazine, Asia’s premier magazine for the ICT Education. Higher education is not only about grabbing some lucrative job but to learn the skills that may help individuals sail through their career with aplomb. This field of education has been expanding rapidly throwing up the need for qualified and skilled graduates, postgraduates and research scholars in the country. Digital Learning ranked universities from different zones of India and shortlisted them on the basis of different parameters – Faculty, Entrepreneurship, Industry interface, Infrastructure, Global Collaboration, Placements, and Swachh Campus. The universities’ total score based on the aforementioned parameters decides their ranks.